This guide is intended to help you with writing well-designed and interesting Arcana Wiki entries that conform to a standard appearance. This isn't supposed to explain the details of wiki code syntax - this page does that far more comprehensively than it could be done here - but tell you how to write new entries (or improve on existing ones) in a way that's useful and consistent with other entries. If an equivalent entry for the Wikipedia exists, use the same spelling for the entry. If an equivalent entry for the TV Tropes Wiki exists, use the same spelling for the entry unless that would conflict with the Wikipedia spelling. Unless it conflicts with the above rules, always use the singular form of a name. If this is too much of a bother, just leave it out. This should contain factual information about the subject of the entry. 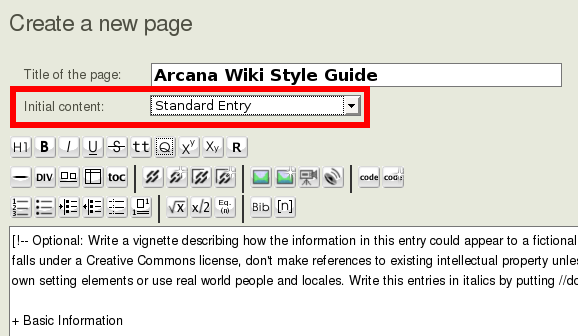 While the standards of verification for the Arcana Wiki are not nearly as high as for the Wikipedia, try to do some research about the subject before you write about it. Do not just make anything up - that's what the "Game and Story Use" section is for. But at the same time, do not make it too dry - it should be interesting to read, instead of a mere collection of data points. After the second ":", you need to enter an external link. External links are contained within single square brackets (i.e. "[ ]"). First you need to enter the URL, and then the descriptive text of the link. * Perhaps the subterranean city [[[Beneath The Earth|is now inhabited]]] by [[[fairy|fairies]]] or other [[[monster|monsters]]]. * A powerful member of those species could use this city as a [[[Elaborate Underground Base|fortress]]]. Perhaps the subterranean city is now inhabited by fairies or other monsters. A powerful member of those species could use this city as a fortress. The idea of an "outro" was taken from the German edition of the "Malleus Monstrorum" for Call of Cthulhu. Each monster entry in that book had an introductory vignette which describes how an unfortunate investigator/victim encountered some terrible monster. Each entry also had an "outro" vignette which explains how someone else found the unfortunate remains of the first investigator. The outro for Arcana Wiki entries should follow the same pattern. The introductory vignette should lead up to the subject to the main entry, and the outro should deal with its aftermath. Again, if this is too much of a bother, just leave it out - perhaps someone else will write one later. Then you can enter the name of the so-called "parent" page of the current entry. Each entry can only have one parent page, so choose carefully - but usually the choice should be fairly obvious. You now can enter the tags you think are appropriate for the page. Think in broad categories instead entering too many specific details. For a "canonical" list of tags, see the List of Tags page. Also set the parent page to "List of Centuries" and give the page the "index" tag. Also set the parent page to the relevant century and give the page the "index" tag. This page lists news articles and events for the year 1994. Also set the parent page to the relevant decade and give the page the "year" tag. Event: The fragments of Comet Shoemaker-Levy 9 start impacting on Jupiter. File the date under the appropriate month. If the date cannot be determined, file it under "Undated". Event: The last fragments of Comet Shoemaker-Levy 9 impacts on Jupiter. This page lists news articles and events for July 16. Also set the parent page to the relevant month and give the page the "day" tag. Hint: Filling out all the details of the various navigation bars can be rather tedious. To speed things up, try to find similar entries and copy them. For example, if you need to create the entry for July 15, go to July 16, click on "edit", copy the relevant portions of the text, and paste them into the new entry for "July 15". Then just change the few numbers that need to be changed. The Wikidot.Com wiki system cannot deal with ":" symbols in page titles. Substitute them with a "-" symbol instead. The wiki system also cannot deal with page titles longer than 60 letters (if in doubt, check the length of the page title in the "Add a new page" form in the side bar - if the title doesn't fit into it, it's too long). If the title is too long, try to abbreviate it until it reaches that length. July 18, 2008: The article shows images of octopi with far more tentacles than usual. Although the exact reason for this is unknown, some speculate that this might be the result of tentacle regeneration going wrong. Summarize the most important points of the article, and provide a link to it in the Bibliography section of the entry. Do not copy the entire article, as this would be a copyright violation. After you have saved the entry, set the parent page to the year the article was published in, and give the article the "news" tag (as well as the "event" tag, if applicable). It is also possible to enter entirely fictional events into the timeline - after all, plenty of games use crossovers. However, fictional events are only worthy of inclusion if they are from established, published works (not from your own homebrew campaign, in other words! ), and if they use the established Earth calendar. Fiction: Delta Green - Major Reginald Fairfield is assassinated in his home, but sends out a final message to other Delta Green Agents. In other words, first write "Fiction:", then the setting this event takes place in (in the form of a link to the page describing that setting), and then the event itself. To distinguish its fictional nature, it must be written in italics. Do not create a new page for this event - that would be beyond the scope of the wiki.